﻿﻿﻿﻿﻿Festival, museum display commemorate centennial of famed vessel. ﻿﻿﻿﻿﻿It’s not every day that you get to celebrate your 100th birthday, but the Battleship Texas will be hosting a centennial festival March 15 with special guests, fireworks, flyovers and much more. The Battleship Texas served in two world wars. Interactive exhibits will highlight the ship’s history as an engineering marvel of its day and its missions across the globe, as well as the history of both world wars, including the Battles of Normandy, Iwo Jima and Okinawa. Visitors will be able to examine vintage aircraft and land vehicles and learn what life on the ship was like for its many sailors. Guests will also be able to view a new video about the ship’s history and tour the Texas throughout the day. All funds raised will support battleship preservation efforts. In 1948, the decommissioned Texas became the first battleship memorial museum in the U.S. and today is anchored in the Houston Ship Channel in LaPorte. TPWD took over management of the historic ship in 1983. In the early 20th century, fleets of armored attack warships guaranteed command of the seas. To keep up, the U.S. Navy replaced the 1892 Battleship Texas with a larger all-big-gun “super-dreadnought” version commissioned on March 12, 1914. More than 1,000 men lived aboard Texas when commissioned; the number increased to more than 1,800 during World War II. 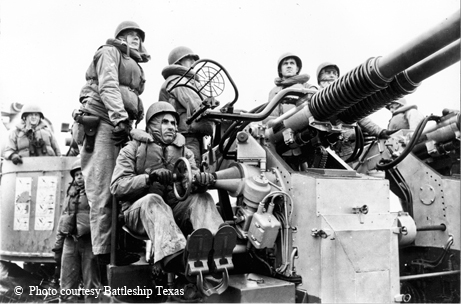 The Texas’ history includes: first U.S. Navy vessel to house a permanently assigned contingent of Marines, first U.S. battleship to mount anti-aircraft guns, first to control gunfire with directors and range-keepers (analog forerunners of today’s computers), first to launch an aircraft from a catapult and one of the first to use radar equipment in the U.S. Navy. The U.S. Navy transferred the battleship to the State of Texas in 1948, and for more than 65 years, the ship has been open as a public memorial at the San Jacinto Battleground State Historic Site. Because of the battleship’s age, key structural areas are in need of repair. TPWD is currently making critical vessel repairs to the ship’s “skeleton” so that the ship remains strong enough to hold herself up. 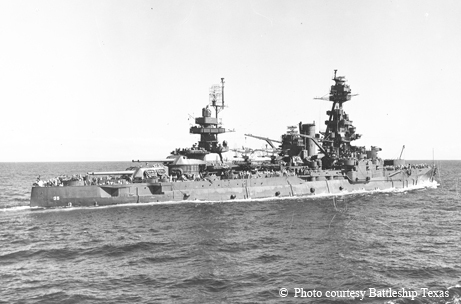 An exhibit, “The Last of the Dreadnought Battleships,” runs through April 13 at the Bob Bullock Texas State History Museum (www.thestoryoftexas.com) in Austin. Artifacts on view include select pieces from the silver service presented by the people of Texas, historical photographs and personal items from men who served aboard the Texas. A special listening station shares crew member memories of service aboard the Texas during World War II. The museum will host special High Noon Talks on the topic the first Wednesday of March and April. The mini-exhibit is a cooperative effort of the Bullock Museum and TPWD’s curatorial services, exhibit shop and state historic sites. To purchase advance tickets for the festival, visit battleshiptexas.org; to find out more about volunteer opportunities or how you can support the Texas, visit www.texasstateparks.org.